Despite the terrible winter storm outside, the 17th annual Mark Jeffrey Memorial Game went about as well as anyone could ask for. Travis Fullerton got his 3rd shutout of the season in a 9-0 win over the STU Tommies. 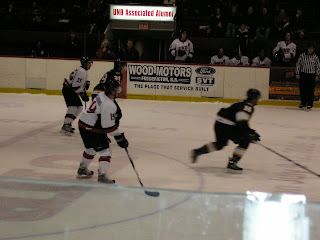 The win leaves UNB with 37 points in the standings, needing 6 points more to clinch top spot in the AUS. UNB heads to Nova Scotia next to play SMU Friday, and StFX Saturday. Great to see a balanced team effort tonight... the team is probably playing their best hockey of the season IMO. Should be an interesting weekend... the only question is who will MacDougall start in net. Anyone know why Harty didn't play? Apparently, Harty is still not 100% due to a blocked shot he took off the foot, ankle, or leg (?) during a previous game. I'm guessing that we didn't see him during the 3rd period or whatever because MacDougall decided to rest him for the remainder of the night. Hope he's fine for this weekend... should be a good one. GO VREDS!